Genealogy is the never-ending story of your ancestors as you track them down and learn about the lives they lived. It is also the opportunity to learn about the communities in which they resided. Recently, I had the opportunity to learn a little bit more about the place I now reside and about a university that I visit a lot from October to March, spending many weekend evenings in Matthews Arena, the oldest indoor ice hockey arena still in use for the sport. A recent Ask-a-Genealogist question had me determining the difference between the YMCA (Young Men’s Christian Association) and the YMCLA (Young Men’s Catholic Library Association). In looking into this question, I found that the first YMCA to open in the United States was in Boston, on 29 December 1851. Like the other chapters in England and Canada, the organizers were intent on improving a young man’s spiritual, physical, and mental condition. The Boston YMCA offered many educational classes from its founding and, in 1896, established the Evening Institute for Young Men, which would ultimately become Northeastern University. Like many people, I categorize my life: job, hobby, family. I am sometimes surprised when two of my categories intersect in this way. In addition to learning something new, it reminds me of the joy of family history research, because without that I might not have made this discovery. At Northeastern’s founding, approximately half the population of Boston was comprised of immigrants or first-generation Americans. The immigrants wanted a better life for their families, and this included education for their children. The YMCA’s Evening Institute and its many other programs assisted these families in realizing their wish. 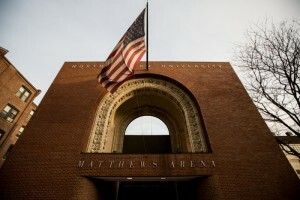 For a genealogist who now calls Boston home, and spends a lot of time in historic Matthews Arena, this discovery reminds me of how many great opportunities we have today, often as a result of our immigrant ancestors and those who founded organizations to help them. Very Interesting story. I have lived in Boston all my life and was unaware of the history of Northeastern. I’m looking forward to sharing with my friends and family who were graduates of this university. Me too!. I am now wondering if my husband’s grandfather may have attended Northeastern. He was second generation Prussian German whose grandparents settled in Hyde Park. He was born there and they moved to Newton Corner (where there is a very old YMCA) and he graduated from Newton High School. He married and worked at various jobs, but became a bookkeeper and ended up a vice president of the original branch of the Newton Savings Bank in Newton Corner. I have often wondered where he may have had his training. Do you know if the alumni records of Northeastern are online? Or, if we can find them at the Northeastern library? Thanks for your article! It sometimes takes only a small bit of knowledge to send you happily on the trail of new information for your family history. Previous generations of immigrants and migrants from our own country into the cities–think mill girls–worked long, hard hours and then became avid students in classes, causes and lectures in the evenings. Their example is awe-inspiring. I am a graduate of Northeastern University as well as my grandfather. Some of my relatives also went to Northeastern. There’s a lot of history between myself and the University. I was very proud to be the grandson of one of the graduates. The Evening Institute eventually morphed into coed Lincoln College. LC became University College, which had Boston and 12 satellite campuses at its height in the 1990s. University College is now the College of Professional Studies and offers programs up to the doctoral level. Northeastern is also heavily involved in cooperative programs with industry. My son went to England to work in a steel forging factory. He was assigned to help set up their first statistical quality control program. He felt that his experience in the Sheffield region helped him discover his true ethnicity. My company in Connecticut employed several Northeastern co-op students in the chemical engineering area. Some became valued permanent employees. While I don’t have many Boston roots, I found this article fascinating. I wonder if Jane Adams’ Hull House, which also served immigrants and their children, led to a similar college or university? So, the young Catholic male librarians had their own organization (YMCLA)? What can you tell us about that? Just as MIT started in a small building which later became the (I think) Museum of Natural History and later Bon Wit Teller’s Dept Store, Northeastern started on Huntington Avenue over a drug store across the street, near to downtown. I graduated from Hyde Park High School in 1943. And would you believe that that Fall was the first time girls were allowed to enter as students at NU. There were 6 enrolled including two from my Hyde Park class. It was a small school then, and as I remember the back page of the quarterly magazine at HPHS had a coupon. You filled that out and with maybe $5 you could enroll. Cost was $125 a semester. After the war one of my classes was in the YMCA building and taught by the author Robert Parker. It was aclas in effective speaker. One of the returning vets brought his child in and described how to change a diaper. There were 3 classes of 1950 A,B and C. There was a rifle range where the student union building is located and the 35 lb. weight was practiced there. A second hand wood track from Boston Garden was in back of THE Opera House for running practice. There was also the Boston YMCU (Young Men’s Christian Union), founded about the same time as Boston’s YMCA. It was seen as loosely affiliated with the Unitarian movement. YMCA was evangelical, and excluded more liberal believers. YMCU is often described as started by Harvard students. My decidely non-Harvard great-grandfather, an up from the tailor’s bench owner of fine menswear stores, was one of the founders. He was also Superintendant of a large Unitarian Sunday School (Church of the Unity in the South End), and an officer in the state Unitarian Sunday School Superintendants organization.